← Credit Where Credit is Due? All I wanted was to comment, and HASTAC wouldn’t let me! 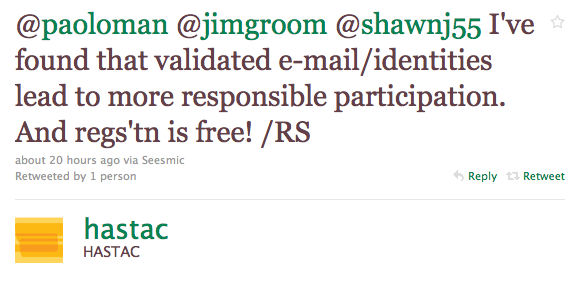 I was pointed to this post by Cathy Davidson about BlackBoard yesterday via this tweet by Shawn Miller, and I was interested in her post about BlackBoard and was ready to comment when I noticed that I had to register to do so. Now I know registering to comment is not the end of the world, but at the same time I immediately lose the impetus to share my thoughts when I have to go through a registration process, get a password (that is in some one else’s database), and then activate my account to leave a simple comment about my own issues with BlackBoard. Fact is, I won’t do it, it is too much overhead, and not worth the bother. Also, it suggests an obstacle to participating and sharing that is in many ways unnecessary. 13 Responses to All I wanted was to comment, and HASTAC wouldn’t let me! Interesting, actually. I have to say I agree: is a site like HASTAC really likely to get trolls of the kind YouTube is notorious for? 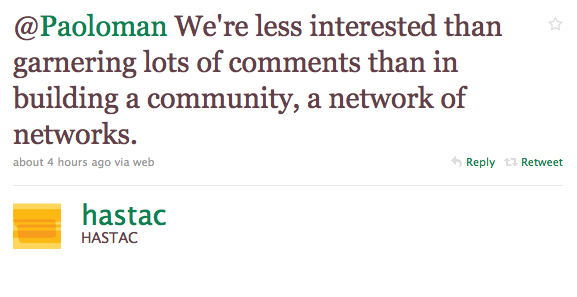 On the other hand, discussions on Inside Higher Ed and the Chronicle do get heated, and maybe that’s not what HASTAC wants. Without pointing fingers, I will also wonder aloud whether HASTAC is interested in collecting information from registrants for e-mailing purposes: I do seem to get a fair number of e-mails from HASTAC that I’m only mildly interested in. I just went in to my HASTAC profile, which tells me that I don’t have any “subscriptions,” so if that’s the case then I don’t know where the e-mails come from. Though I might just be missing some setting in my HASTAC profile. 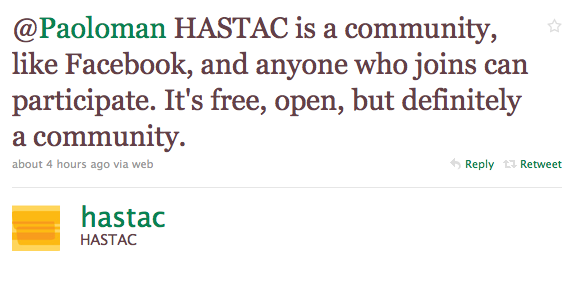 HASTAC feels like it’s trying too hard. I expected the next tweet to have something about synergy, leveraging, cloud or optimization in it. BTW – standard practice on Duke Libraries sites, including our CIT blog, is to allow all comments -but moderate them. That means I dump out nearly 3000 spammy comments a week, and keep 3-4. Askimet is pretty good, so I don’t mind. Blog sez “Register to Comment”? Me sez goom bye. CLose window. I didn’t read this post, but I will have Suicidal Tendencies in my head for the rest of the day, thank you very much. Didn’t even think of the email/data collection angle, that is another level that suggests a necessary distinction between a commentor and a community member, they shouldn’t really be one in the same, even if the process if free and relatively easy—it is still enough not to do it. I agree, a little too hard. Moderation seems the key, and Akismet for Drupal would probably catch 99% of the spams. And then there is captcha—I truly wonder if the conversation would go South if comments were opened up, or the community negatively affected. A rule to live by, and it seems so simple. That’s the reference, glad you got it. Was gonna say something about a Pepsi but that would make it too easy. Jim, I appreciate and understand what you’re saying here. I do hope the people at HASTAC take note and rethink accordingly. At the same time, I’m not sure that such rethinking need necessarily lead to a change in policy. I think the point is rather that they hadn’t really thought through that policy, or its implications. If I may be a devil’s advocate, I think that there may well be justifications for a site at which you have to register before commenting. Why not? It will indeed lead to a different kind of community. And in theory, at least, what’s wrong with that? Yes, that will mean that people such as yourself will be less likely to intervene. It will be a more homogenous community perhaps: more faculty, fewer edutech people. But let a thousand flowers bloom! It’s just that the reasons they proffer for the registration policy sound too much like kneejerk responses on the part of the site administrators. More generally, however, it does sound as though the current theme in the edutech blogosphere is that of inclusion and exclusion, recognition and marginalization. Or to put this another way: I wonder about the context and broader relations between this post and your previous one on accreditation. It would be worth joining up a few dots. Funny you should connect this to the “Credit where credit is due?” post. Fact is I think there is something I am feeling deeply ambivalent about, and I’ll be the first to agree that the HASTAC comment issue is simply a silly annoyance, not a larger issue beyond that, but at the same time I want to seamlessly join in the conversation, and I think Cathy Davidson’s blog invites it given her regular postings. Fact is, I can’t see those dots clearly, I am trying to wonder why I feel somehow intentionally outside and inside academia all at once. Part of something I believe in deeply and resist the idea of constantly. I wish I had a sense of being excluded, and I am almost looking for that, because I am realizing more and more people actually read my work and for some odd reason take it somewhat seriously. The fact sits very strangely with me, and as I said while writing this today to a number of people in my office I am consistently trying to undercut that sense of my voice through trying to be discredited by being brashly annoying. It might be working as a long range strategy, but more immediately it seems to reinforce a sense of a persona I don’t completely understand, but have fully built. Fact is, I have taken a lot of credit away from a lot of people through this style and approach, and co-workers and various faculty and students at UMW have been more than gracious about me being the name associated with the work, and I know its wrong. I’m a metonym of their labor in many ways. So me crying for credit would seem all the more odd given many whose work I use regularly just go about their business and laugh me off, the best possible approach. Yet, crying about commenting on the HASTAC site seems another way at a question of blustering in order to discount some of my sense of credit and voice. I don’t know, and I’ll ask for help here cause I really can’t see the connection between those dots clearly, I know there is a deep connection but I am also afraid it is deeply linked to some strange ideas of self, voice, power, community, etc. that I can’t clearly peel away. I’ve been plagued by this more and more these days, because I think more and more I am seeking some nebulous idea of credit that is the trappings of a whole different mindset, one I pretend to resist. Anyway, as you can tell, I’m genuinely confused on this, but I have to think it is important because it pains me pretty deeply when I try and write about it. Thanks for all these good comments. Amanda, if you are receiving more than four to six emails a month, something is wrong. Write us and we’ll check into it. If that’s too much, you can unsubscribe. Everyone else, your point is entirely valid—we just don’t have the staff to moderate comments. We’re a voluntary, FREE organization and we do a lot, but we don’t do everything. Life is a series of choices. Ours isn’t perfect, but it works very well for our purposes and a different choice–toward anyone being able to leave comments without being part of the community and ascribing to community standards==simply has consequences we don’t have the staffing to take care of. We all put our energies where we can. That said, your points are well taken. By the way, I’m a fan of this blog and of Jim Groom and I’ve never left a comment before so, odd as it is, all this is good in its convoluted way. This as all just a ploy to get you to comment on the bava, you know that, right? More seriously, I realy don;t mean to blow this out of proportion, but unfortunately that’s usually my style, the comments thing does seem silly on one level, but on another I think the willingness for many to comment on your work regularly would change if it were not login. I may be wrong, but I think it’s almost a mental block when you see the login/signup link. Anyway to allow comments on a blog by blog basis, so the are not open globally? Also, Akismet may save a lot of trouble in terms of the human and robot spams. Either way, I’ll drop the subject now and have to say when I was studying early American Lit at the CUNY Grad School I was a fan of your seminal work Revolution and the Word, and seeing you deeply involved our current revolution of the digital word was very, very exciting. What kind of emergence of identities, nation and the like are we currently witnessing with these new genres seems to be a key series of questions that we need to ask and think about. I guess those are the bigger questions I should be thinking about in regards to Jon’s comment above, rather than whose crediting who, or who can comment where. It is a murky space these days, and I appreciate you being so cool here, despite my digital tantrum. Do their blogs take trackbacks? 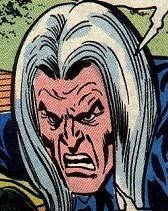 In the good old days, blogs didn’t have comments. You had to respond on your own site. Such practice would certainly speed up understanding that the internet is the platform. So the conversations flow where there is down hill. Watch the bava blog trailer! Generations from now, they won't call it the Internet anymore. They'll just say, "I logged on to the Jim Groom this morning. Everything Jim Groom touches is gold. He's like King Midas, but with the Internet. My understanding is that an essential requirement of the internet is to do whatever Jim Groom asks of you while you're online. @jimgroom is the Billy Martin of edtech. My 3yr old son is VERY intrigued by @jimgroom's avatar. "Is he a superhero?" "Well, yes, son, to many he is." Jim Groom is a fiery man. “Reverend” Jim “The Bava” Groom, alias “Snake Pliskin” is a charlatan and a fraud, a self-confessed “used car salesman” clawing his way into the glamour of the education technology keynote circuit via the efforts of his oppressed minions at the University of Mary Washington’s DTLT and beyond. The monster behind educational time-sink ds106 and still recovering from his bid for hipster stardom with “Edupunk”, Jim spends his days using his dwindling credibility to sell cheap webhosting to gullible undergraduates and getting banned from YouTube for gross piracy. #Domains19 Minority Report Part 1: Face it, Gif it – MASHe on Why Sponsor those #OER19 Hippies? Hey McFly, Register for Domains19! Why Sponsor those #OER19 Hippies?